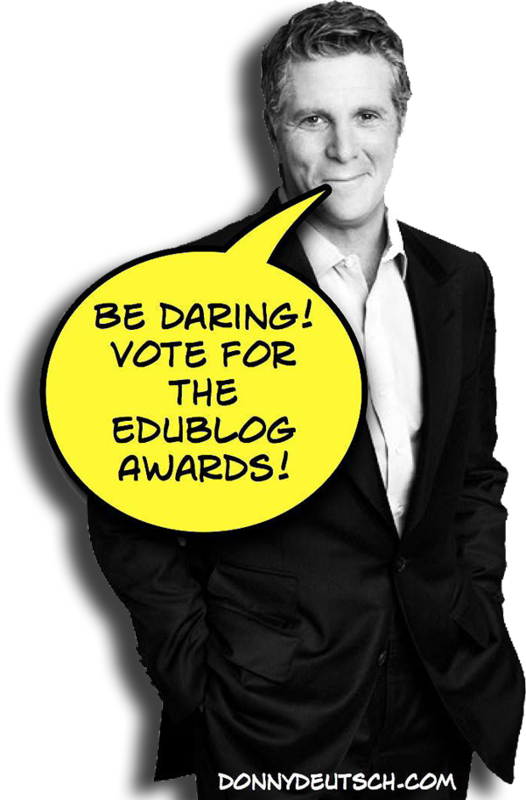 Edublog Awards Nominations <BR> & Shameless Campaigning! You know how most people say about awards "It's enough just to be nominated?" Well, I think most people are fibbing! 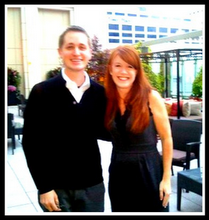 Sure, it's TOTALLY true that it's a distinct honor to be nominated! 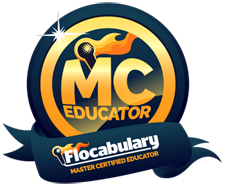 Especially for a crowdsourced award like the International Edublogs Award! I also gotta argue with the (mis)quote from the cinematic oeuvre Blazing Saddles "We don't need no stinkin badges" - because yes, YES we do! Oooh shiny shiny! Maybe it's because I was kicked out of the girl scouts for talking too much in 5th grade - I just can't help but love the monetarily free but oh so personally rewarding little square .jpeg badges that shows that my contemporaries & colleagues feel that we and what we're doing matter! So yeah, WOW! 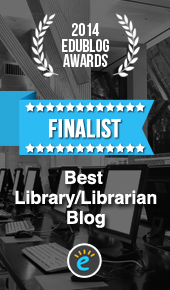 I can't help but be psyched that I was nominated for Best Librarian/Library blog! That's totally mind-blowing, humbling, and a true honor! And sure - I could be all "I don't care if we win" but that would be disingenuous, and why the heck not try to win!?? LOL Do you think that Lady GaGa doesn't want to win the Grammy? Do you think that ANYone nominated for an OSCAR doesn't wanna get that sweet shiny gold statue? HA! It's human nature! So am I gonna campaign? Well, yes and no. I'm not gonna hire PR guru Donnie Deutsch or the Goodyear Blimp! (Cha ching!) But I am blogging saying YAY! 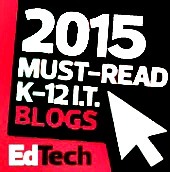 Thank you, We're honored & please consider voting for me! Both here to you my dear Daring Librarian blog readers and to my students, family, & community at the Daring School Library Blog! Is that shameless? YES! Thank goodness I'm totally OK with being shameless! 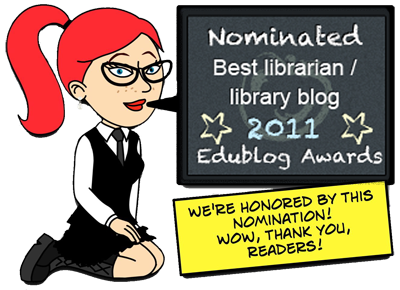 Best Librarian / Library Blog - The Daring Librarian.com Nominated by The Library Girl, Jennifer LaGarde! Thank you! Ms. Gwyneth Jones, your snarky neighborhood Daring Librarian, was also nominated in 3 other categories (I know, pinch me right?) If you would like to vote for her, here are the links & what to look for! Thank you! 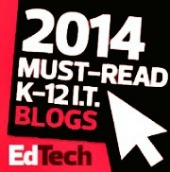 Most Influential Blog Post - drop down last on the list Gwyneth Anne Bronwynne Jones for Lady GaGa Librarians Unite! Nominated by The Mighty Little Librarian Tiff! - Thank you! 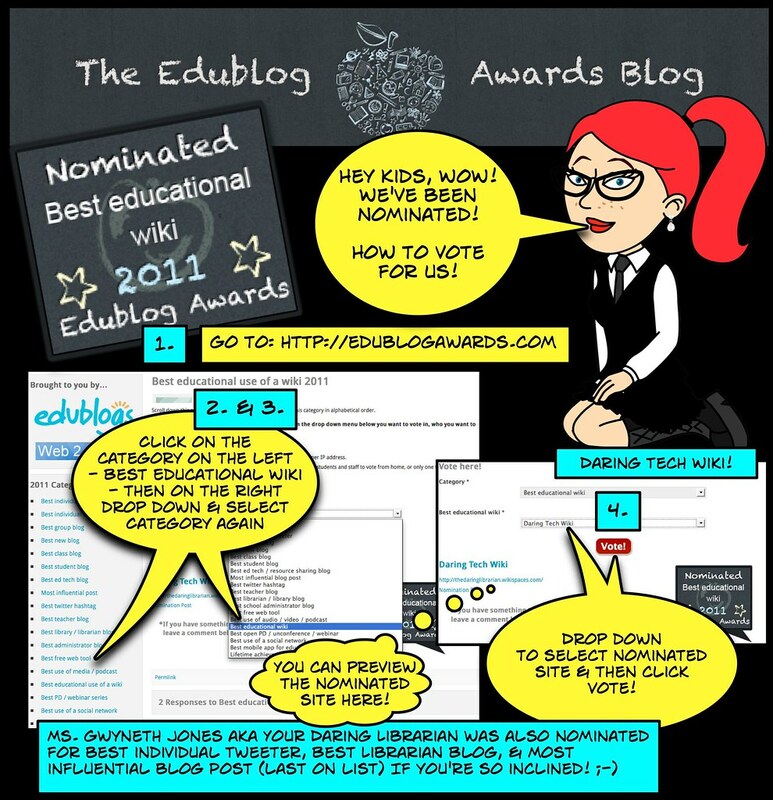 Best Educational Tech Wiki - Drop down & look for Daring Tech Wiki!~ Nominated by the amazing Tamara Cox – Eliterate Librarian - Thank you! Thank you everyone else who nominated me! 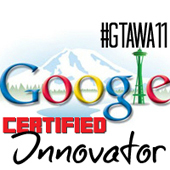 I'm thrilled to be considered - and in the words of the venerable Wayne Campbell "I'm not worthy!!!!!!!!!!!" Now a shout out to my friends! Please consider voting for some of my Geek Tribe peeps...even though some are competing with me with the same categories :-) And some are nominated in more than one...What can I say? They're my friends! & I'm thrilled that some of my nominations (and others!) came through & they made the "short list!" Woohoo!!!! I HEART my PLN! 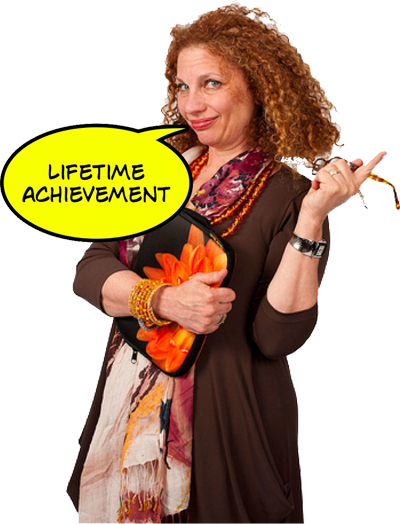 Lifetime Achievement - Dr. Joyce Valenza! 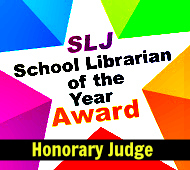 Come on all Teacher Librarians...this is the year our Joyce gets this! 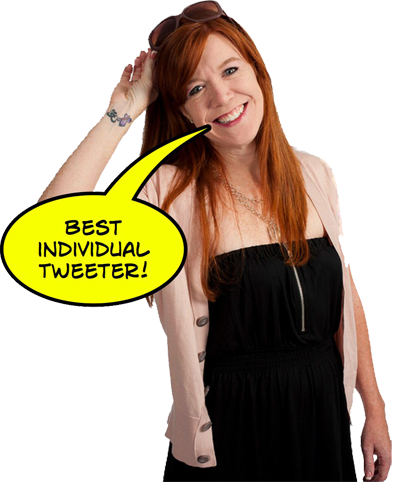 Best Individual Tweeter - Shannon M. Miller Her useful & positive Tweets brighten & inspire me! I also have to give mad props to Steven Anderson Seriously, the guy is a rock star! 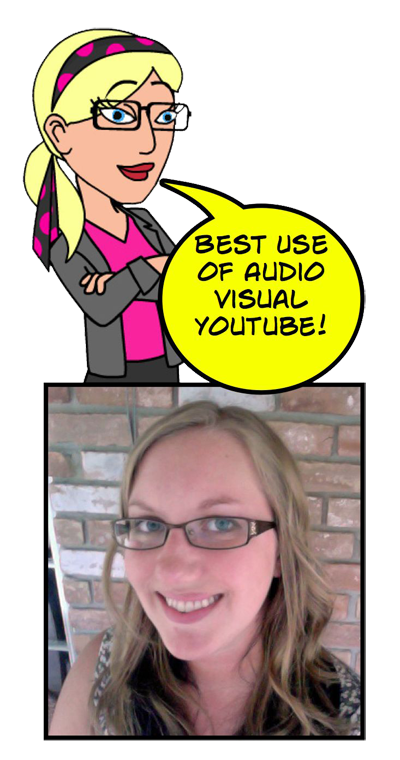 Best Audio / Video / Podcast - The Mighty Little Librarian Tiff for her AWEsome YouTube Channel! The Mighty Little Librarian's Tech Tuesdays. I love this series because it helps her teachers learn more about technology, improve their teaching, and advocates for her role as a tech leader in her school. All around a wonderful project. I always get great ideas from Tiff! I'm flattered she considers me a mentor but honestly, it's a lovely symbiotic relationship where she takes ideas from me & expands them into new fabulousness and I take ideas from her and get continuously inspired! 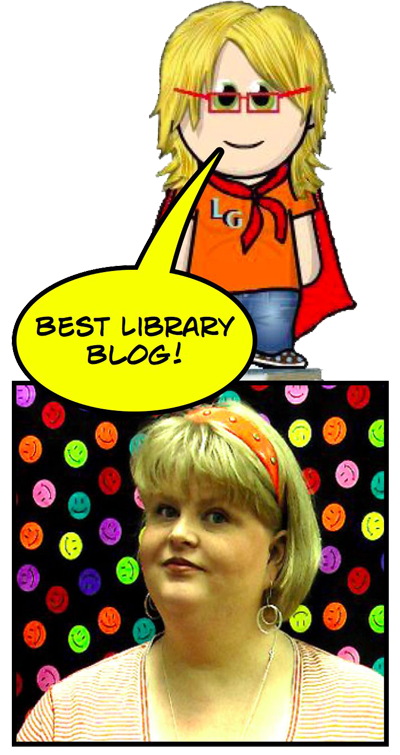 Best Library / Librarian Blog - Library Girl, Jennifer LaGarde This is the toughest one for me EVERY YEAR because within my PLN there are so many wonderful librarian bloggers, but this year my nomination goes to one of my mentees Jennifer LaGarde's blog! She has consistently inspired me with her creative ideas and passion! She is a true mover & shaker in the library world! 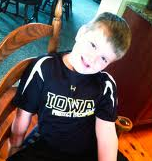 This kid is amazing! 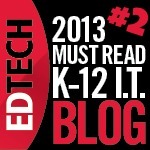 You gotta check out this blog! It's visual, upbeat, interesting, engaging, and very very AWEsome! 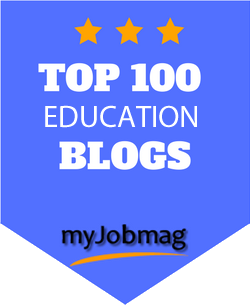 "This blog is the story of John Schu and Shannon Miller connecting their amazing students at Brook Forest Elementary in Oak Brook, Illinois and Van Meter Elementary in Van Meter, Iowa." Awww thank YOU! I say it all the time but I will continue to say it over and over -- you are the BEST! And I adore the comic tutorial on how to vote...yay! You're very welcome dear Tiff! Your nomination is SO well deserved! Thank you dear Jane! I love to have your cheers (and a few votes! lol) Srsly, thanks a bunch! Format MS Word Like a Ninja Super Hero!